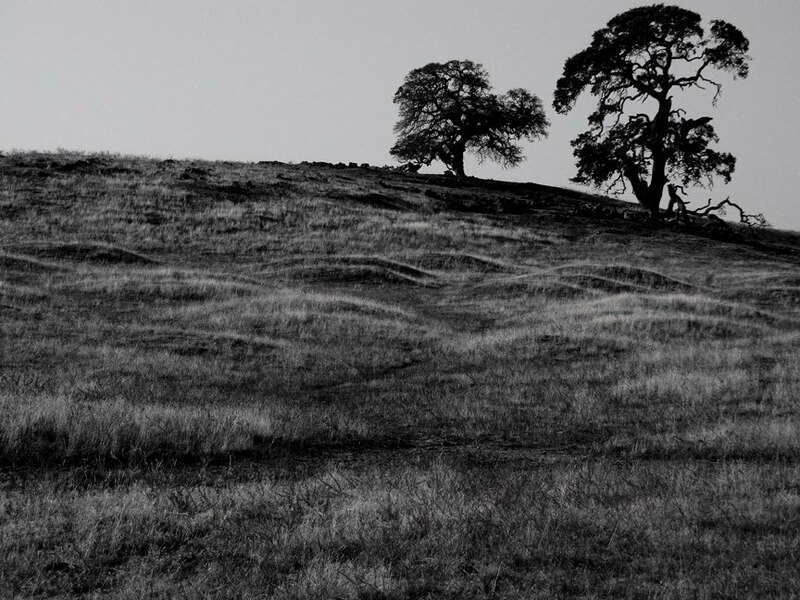 I wrote a post a few days ago about the "Other California", describing a section of the prairies that surround California's Central Valley, a much diminished and much ignored part of an extraordinary state. The title I gave the post stuck with me as I drove across about half the state on my way to a family Thanksgiving celebration, and I had the germ of an idea of a future series on Geotripper, a geologic tour of the parts of the state that most people never see. 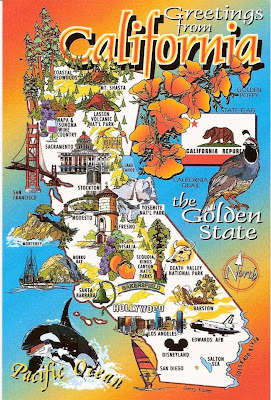 It occurred to me that if I am going to write about the "Other California", I need to define what the "Other California" is not, hence today's odd title. It didn't take long to figure out how to find the places "everyone knows": I was on the road, there was a tourist trap with bathrooms, and a bunch of postcards for sale. What better place could there be for the attention-deficit-disorder tourist to find out the important sights to see. I grabbed two postcards showing the whole state (50 cents apiece or 3 for a dollar; I grabbed a third card that shows the famous Tehachapi Loop). The cards are published by Scope Enterprises, Inc (no web presence that I could find). The first card has a lot of information packed in a small space: LA, San Francisco, San Diego, Disneyland, Napa-Sonoma, and much to my surprise, a whole gamut of Central Valley cities: Sacramento, my own Modesto, Stockton, Fresno, Visalia and Bakersfield. The national parks are there: Yosemite, Sequoia/Kings Canyon, Lassen Volcanic, Redwoods, Death Valley, Joshua Tree, and Channel Islands. Mentions of the coast, Hollywood, Salton Sea. All in all a pretty good effort at nailing down the main tourist destinations, pretty much a checklist for the first-time California traveler. It even includes a few of our state symbols, the Golden Poppy, the California Quail, and the state flag. I like the second card even more: the Natural Wonders of the State. The same national parks, plus Lake Tahoe, the Colorado River (so big and wide that it looks like California is probably already falling into the sea), the Mojave Desert, Bristlecone Pines, California Condors, Sea Otters, Mt. Shasta, and Morro Rock. Best of all, a red dotted line representing the San Andreas fault winds its crooked way across the state. I don't necessarily expect perfection in postcard maps, but this one takes the cake! 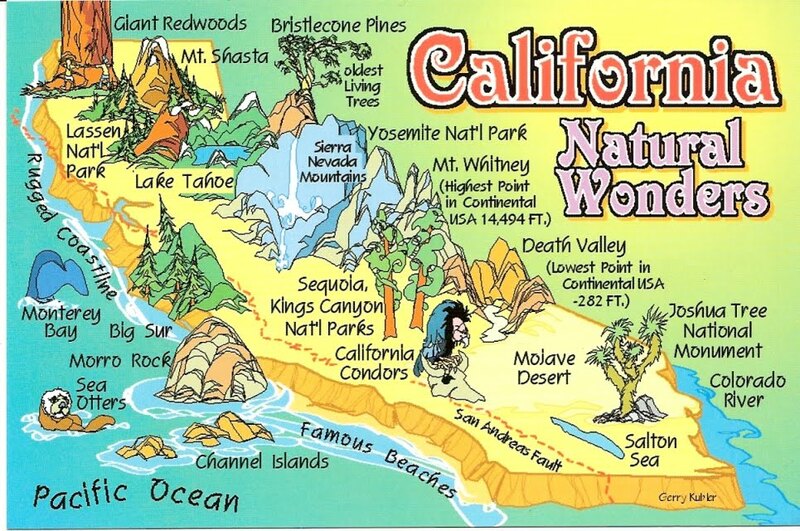 So, in future posts about the "other" California, these are generally the places I won't be talking about (I may make an exception over Morro Rock and perhaps the Bristlecone Pines). It's not as clear as Tony's, taken as it was from the backseat of a speeding car, but I have my own documentary evidence now of the visibility of Half Dome from the floor of the Central Valley. 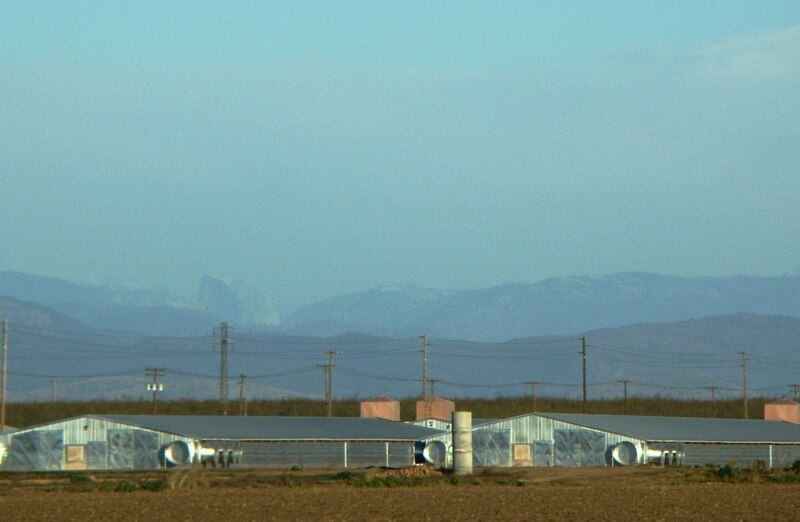 The question came up last February when a picture in the Patterson Irrigator seemed to show Half Dome rising in the far distance (something like 80 miles away). A hot discussion followed, and the photo by Tony Immoos pretty much settled the issue. 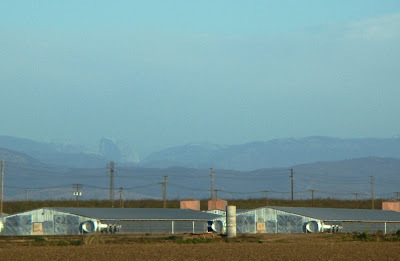 I was pretty sure I had seen Half Dome from the vicinity of Keyes Road near Turlock a few times, but never had a camera with me on those unusually clear days. We were on our way home from the Thanksgiving holidays, and just a few miles from the end of the journey, near the junction of Keyes Road and Oakdale-Waterford Highway, when I spotted a familiar shape. I grabbed the camera, put it on extreme zoom (about 30x), and snapped a few shots. I had to up the contrast, but the shape of the big rock is clear, a little bit to the left of center. I think it was more visible on this particular day, because the peaks behind the dome are obscured by the clouds of a retreating storm. On a related note, I blogged last March about not quite knowing the names of the mountains visible from a road near my house. It turns out that by the map, I was looking straight into the heart of Yosemite National Park, and in fact almost directly at the peaks above Yosemite Valley. The pictures are too blurry to name the individual peaks, but thanks to Steve Cosner, I'll be ready when I get some clearer shots! 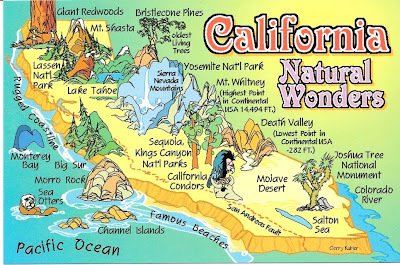 California is known for many unique landscapes, including renowned scenery like Yosemite and the Sierra Nevada, the Big Sur coastline, or the forbidding wastes of Death Valley. There are also, of course, the urban landscapes of San Francisco, Los Angeles and San Diego. But there are some places in the state that are rarely noticed or considered. 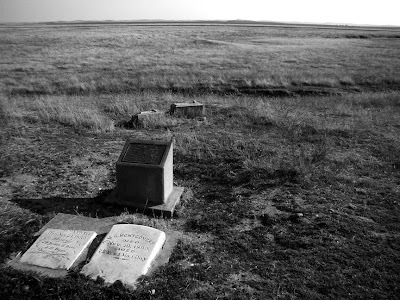 I live on the edge of one of those unique places, the prairie lands that surround (and once covered) the Great Valley province. It is a lonely region, dotted by the occasional orchard or cattle ranch. These lands, for particularly geologic reasons, were never developed for agriculture the way the Central Valley was. Wandering the backroads beyond my small village is a journey back into California's past, before the wholesale transformation of the landscape into farmlands and urban skylines. There are several distinct regions of prairies around our valley. Farther south, near Coalinga and Bakersfield, and adjacent to the Coast Ranges, the prairies are drier and more alkaline, more nearly a desert landscape. 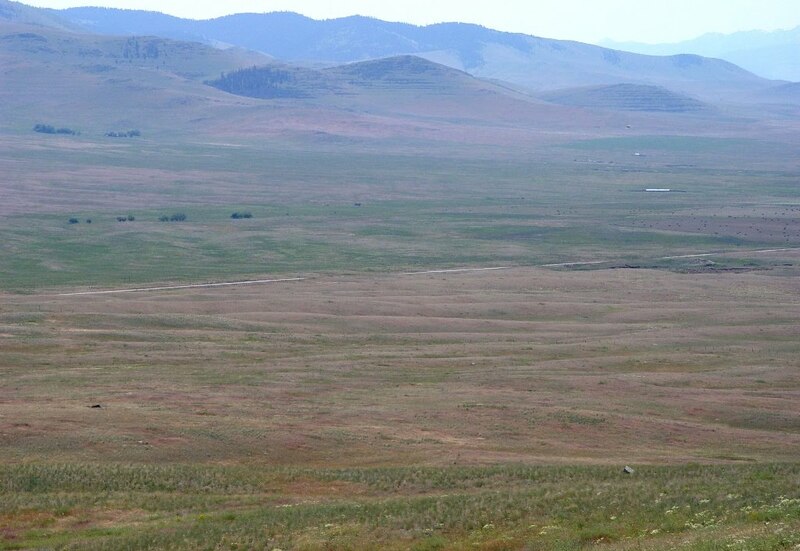 A portion of this region has been preserved as the Carrizo Plains National Monument, which I may describe in a separate post. 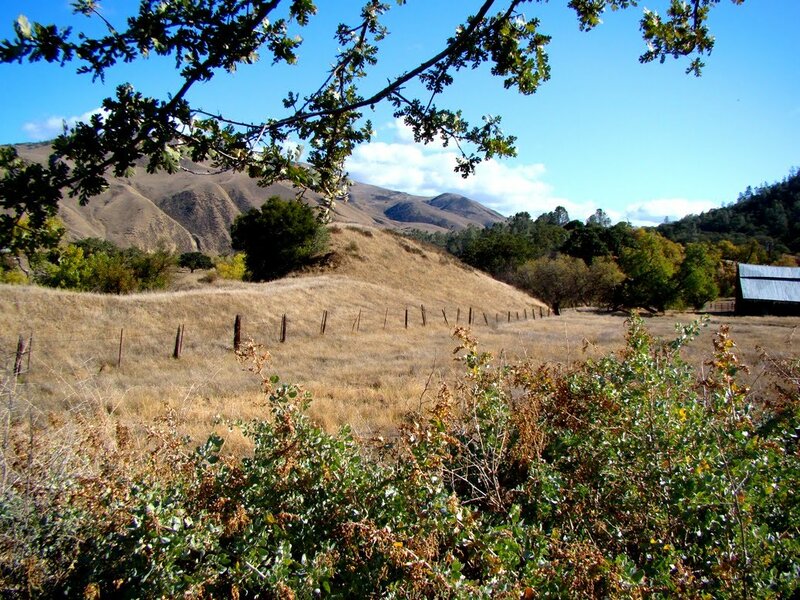 It is also a great place to see the San Andreas fault! The region in which I live is a transition zone between the rich agricultural soils of the Central Valley around Fresno, Merced and Modesto, and the rocky ridges of the Sierra Nevada foothills. 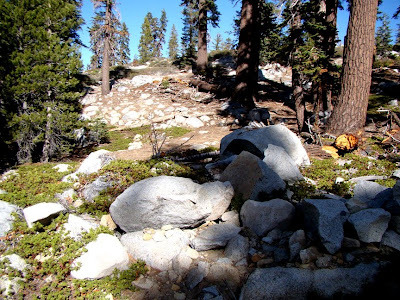 The underlying rocks include alluvial fans that developed as muddy rivers flowed off the Sierra Nevada block during the ice ages, and some of the volcanic lahar deposits and ash flows that preceded the glacial times. Rivers have not flowed across these surfaces for tens of thousands of years since the ice last invaded the high country. This long period of chemical weathering has resulted in the development of a clay-filled soil rich in iron oxide and hardpan (caliche deposits). The occasional winter rains that we get cannot sink far into the surface, so the primary vegetation is grass and wildflowers. A few oaks dot the higher hills. 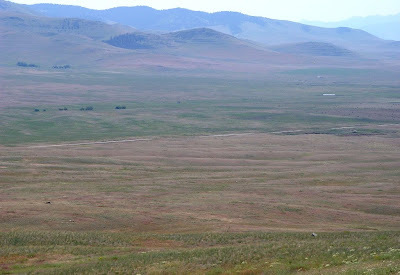 In historic time, before the ranches, these prairies were grazed by tule elk and pronghorn antelope. The pronghorns were hunted to extinction by 1920, and the elk that roam a few isolated refuges are descended from single pair found in Kern County in the 1920's. California grizzly bears also lived here. In much earlier times, prior to about 12,000 years ago, the fauna included horses, camels, bison, mastodons, and mammoths. Giant condors flew overhead. Sabertooth cats, dire wolves and American lions hunted the grazers. Some surfaces (as in the photo above) are covered by a regular pattern of small hummocks called mima mounds. Their origin is enigmatic, but is probably related to thousands of generations of ground squirrels occupying the same individual hills year after year. Other more exotic explanations involve Native American burials, odd earthquake waves, and periglacial soil activity. 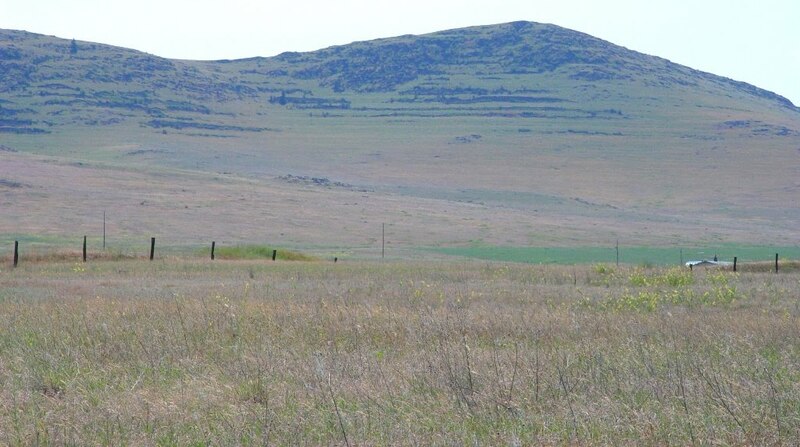 The bottom photo shows the geological relationships in the prairie outside my town. In the foreground, the protruding rocks are part of the metamorphic bedrock of the Sierra Nevada, dating to Mesozoic time. These rocks were highly deformed and deeply eroded during the late Cretaceous and early Cenozoic, between 80 and 40 million years ago (approximate dates, and mildly controversial). 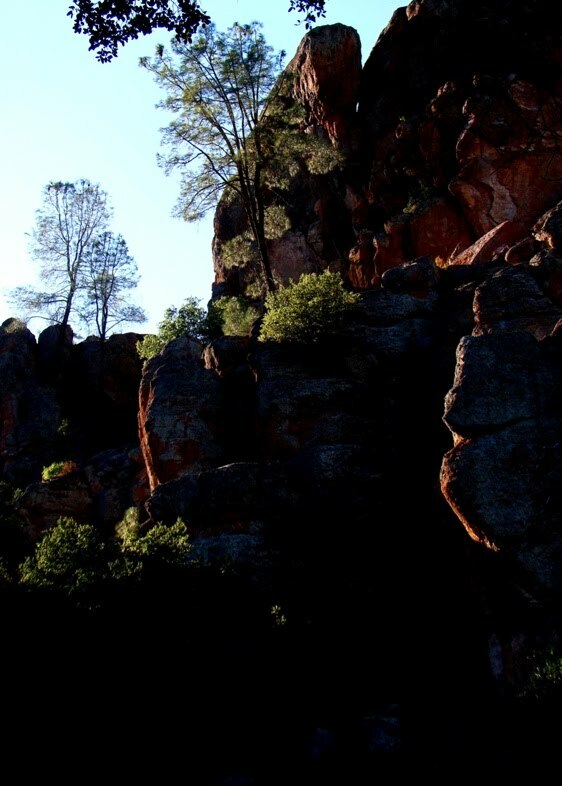 The erosional unconformity is covered by ash flow deposits from about 22-28 million years ago that originated near the present-day Sierra Crest around 40 miles to the east (the Valley Springs Formation). The ash is in turn covered by voluminous lahar deposits (volcanic mudflows) of the Mehrten Formation, dating to around 9-11 million years. The lahars are probably responsible for the prominent ledges on the hillsides. When I first came to live in the Central Valley, I didn't always appreciate the serene beauty of these wide-open landscapes. The geologist in me always wanted to see high mountains and steep-sided plateaus. The landscape has grown on me...the prairies are a special place. I remember journalism class from junior high: the five 'W's, who, what, where, when and why, and always present BOTH sides of the story. Reading the paper the other morning, I ran across the kind of article (on the possibility that we are in the "end times") that makes me bemoan that second rule that journalists seem to follow so carefully. Presenting "both sides" of a story tends to elevate the wrong side of the story to some kind of equivalence. This is seen often whenever a newspaper decides to cover some facet of creation-science, but it also shows up in this article on end-of-the-world mania. 20 paragraphs in the article quote the "true believers" or discuss the religious beliefs concerning the end times, while only 8 cover the comments of social scientists or skeptics. This story was carried on the front page, no less. And of course, the producers of the movie "2012" are raking in the dough for capitalizing on the mania. Even I enjoyed watching California fall into the Pacific. Entertaining? Maybe. Helpful? Not really. Believing that the world is going to disappear, or that civilization is going to collapse takes away any kind of feeling of responsibility one might have for making things better. Why feed hungry people, or find shelter for the homeless, or work to lessen the impacts of global warming when the whole shebang is going to end in a few months? Are you truly interested in learning about the potential for real disasters, with data that is grounded in reality? There are a lot of fascinating possibilities: the world is full of fault lines, volcanoes, steep mountains, huge river systems, and glaciers. I ran across a great article today in the High Country News that is a lot more responsible, and much better for the workings of your brain cells. It is a feature article on the Spokane Floods and J Harlan Bretz. Try to imagine much of state of Washington being flooded by the collapse of a vast ice dam that released the equivalent of several Great Lakes in the space of a day or two. It really happened! Repeatedly. I've taken my students on tours of the region discussed in the article. 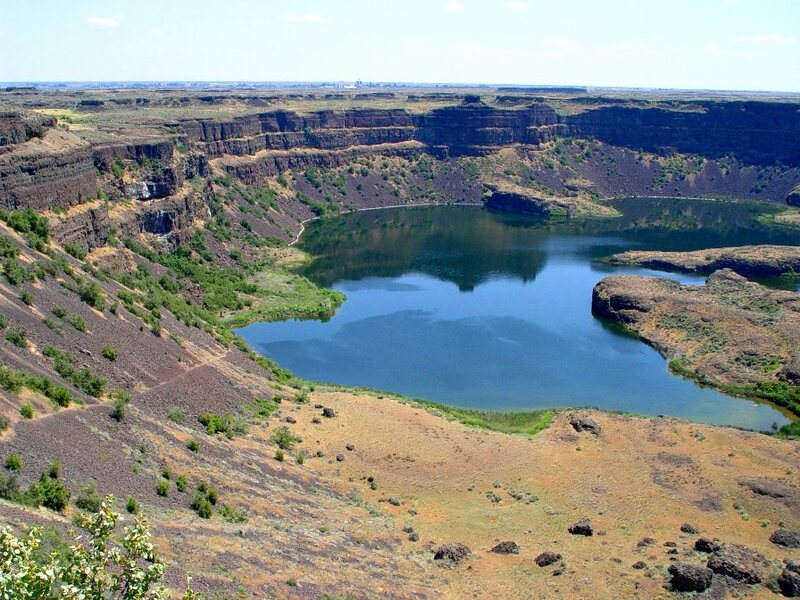 Dry Falls, near Grand Coulee Dam (in the top photo) was the site of a 5 mile wide river that was more than 250 feet deep during the height of the floods. The lake that provided all the water covered much of western Montana (Lake Missoula). Abandoned lake shores can be seen in the third picture as terraces on the hillside. When the lake drained, the fast flowing water left behind giant ripple marks on the valley floors, such as those at the Camas Prairie, seen in the second picture. 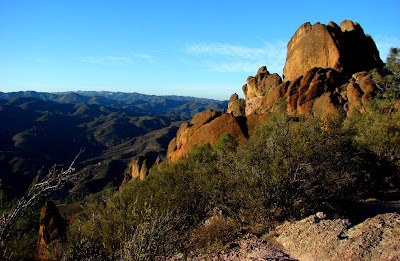 One of California's hidden treasures is Pinnacles National Monument, in the Coast Ranges south of the town of Hollister. It was the main destination of our field studies class last week as we explored sites along the San Andreas fault. Some of our other stops were described here, here and here. The park was established by Theodore Roosevelt in 1908, to preserve the unusually rugged scenery that is quite unlike that of most other parts of the Coast Ranges. The surprising geological significance of the park was not discovered until a half a century later. I described the geology of the park in some detail last year, so I won't repeat myself too much, but essentially the park is half of a rhyolitic composite volcano that erupted 23.5 million years ago...right on top of the San Andreas fault! The rhyolite weathers into the beautiful spires and peaks that are the centerpiece of the park scenery. In the 1970's, geologists were looking to understand the nature of movements along the San Andreas fault, and some of them noted the apparent similarity between the Pinnacles volcanic rocks and those of the Neenach Volcanics down in southern California near Palmdale and Gorman. 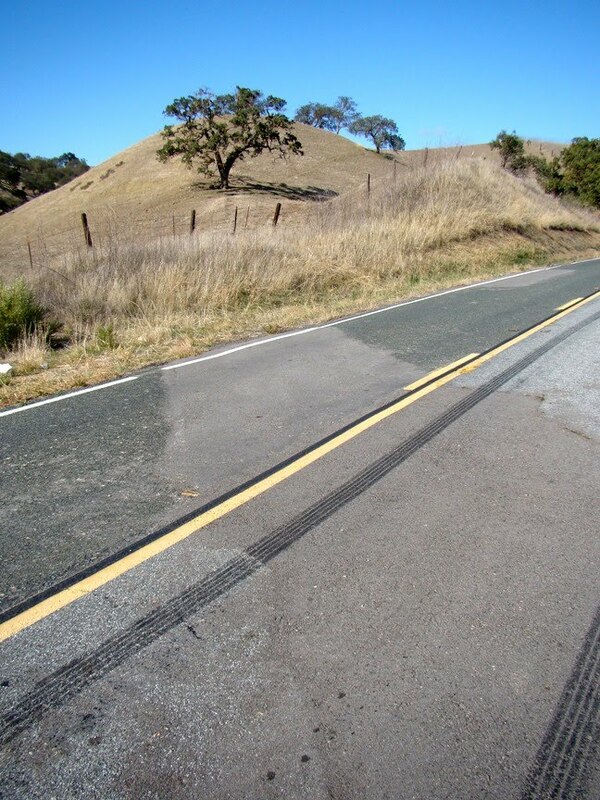 V. Matthews was able to demonstrate that they erupted from the same volcano, but that the rocks were separated by 195 miles by movements of the San Andreas fault. The discovery was a powerful confirmation of the possibility of large-scale motion of the crust of the earth. Because of the crap going around today about the end of the world and 2012 movies, I feel duty-bound to point out that this 195 miles of movement was accomplished by thousands of individual earthquakes happening once every few hundred years, with 10-20 feet of motion during each earthquake. Such earthquakes are likely in the near future, and they will be disasters, but they will not be anything like what goes on in Roland Emmerich's imagination, as entertaining as his movies may be! A busy week prevented me from finishing a narrative on our field studies adventure along the San Andreas fault last weekend. 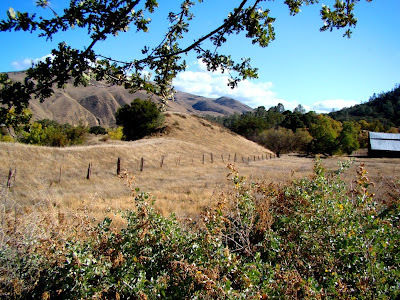 Part I discussed active creeping in the town of Hollister, California, while Part II revealed some landscape features along the San Andreas fault south of Hollister near the Gabilan Range. Another stop was to have a look at the DeRose Winery in the hills south of Hollister (a disclosure: we always stop here, but we had a schedule problem last week, so these pictures are from a previous trip. Students: this is what we would have seen!). The DeRose, under one name or another, is one of the oldest wineries in California, dating back to 1854. It was once called the Cienega Winery because of the nearby marsh that turned out to be a sag pond along the active trace of the San Andreas fault. The foundations on the original building failed for (then) unknown reasons, and the winery was rebuilt in the same location. That building came apart as well, and was again rebuilt in 1948. When the present building began cracking up, investigations by geologists showed that the winery had been constructed on top of an actively creeping section of the San Andreas fault! It has been a field trip destination for generations of geology students since the 1960's. As can be seen above, the building is being offset, ripping apart along the foundations. The adjacent driveway has been patched numerous times. The most striking feature on the property is a drainage culvert that was apparently built in the late 1800's or early 1900's. It has been offset by around 3 feet in that time. The USGS has posted an excellent field guide for the Hollister region that has maps and pictures of the winery, and the Hollister neighborhood discussed in part I. The guide is part of the conference publication of a meeting of the National Association of Geoscience Teachers in 2001 concentrating on the Geology and Natural History of the San Francisco Bay Region. The guide is available from the USGS online only, although the Far West Section of the NAGT has paper copies for sale (proceeds support student scholarships). Let's face reality, nothing we geologists will have to say is gonna change anything about the "science" in this movie. So just sit back and enjoy the special effects, and try not to laugh at inappropriate moments. Geologists get to be heros. Oh, and Woody Harrelson dies one of the greatest geological movie deaths ever. A lot of stuff happens, and practically everyone else dies too. As noted in the previous post, we spent last Saturday on a field trip exploring the San Andreas fault system between Hollister and Pinnacles National Monument. 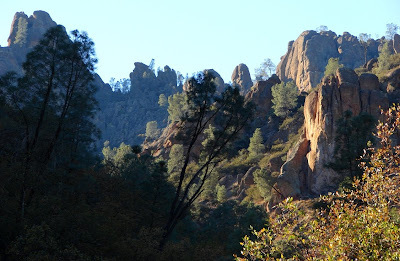 After our walking tour of downtown Hollister, we set off to the south on Highway 25 towards Pinnacles. Along the way we crossed the San Andreas fault several times, and saw numerous signs of the fault's presence. At the farm in the picture above, one has to wonder why a sharp linear hill rises out of the ground in the middle of the valley of the San Benito River. This is a scarp of the San Andreas fault, created as a hillside was split laterally and transported into the valley (because the ridge blocks off stream flow across the valley, it has been called a shutter ridge). The fault literally follows the fence line! I can think of few places where the fault is so clearly delineated. Up the road a short distance, a streambed has been offset in a right-lateral sense . Note the two 90 degree turns the channel makes; the fault follows the channel across the center of the picture(the tight grouping of three oak trees has moved to the right of the single oak down in the channel on left side of the picture). Benches and small landslides also mark the fault trace. The San Andreas fault crosses the highway in the picture above, but they repaired the road! There used to be a prominent bump as one passed from the North American Plate to the Pacific Plate. 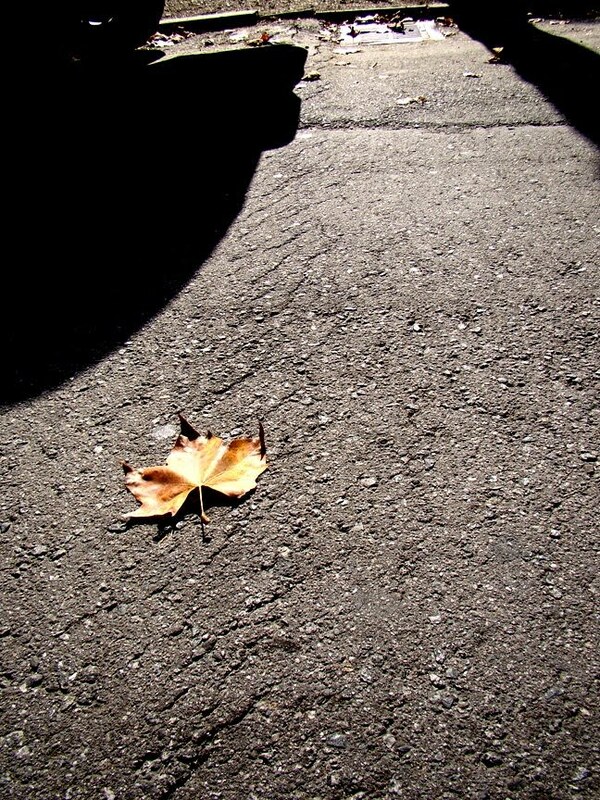 I dug into the archives to find a shot of the road after an earlier attempt at patching the damage..
We are well into the fall, but California weather is, well, really nice (and please use the word "drought" quietly around here; it is a touchy subject). Although each week in the month of November brings more snow to the high country of the Sierra Nevada, the Coast Ranges can be visited all year, and so 15 of my students joined me Saturday on a tour of the San Andreas fault in the vicinity of Hollister and Pinnacles National Monument. 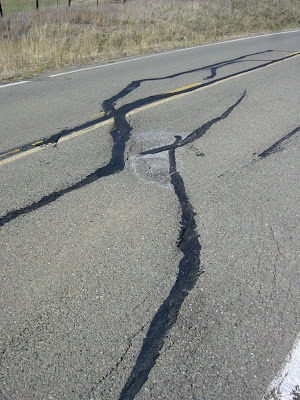 The town of Hollister has been famous among geologists for years as an example of a place where active fault creep can be observed. 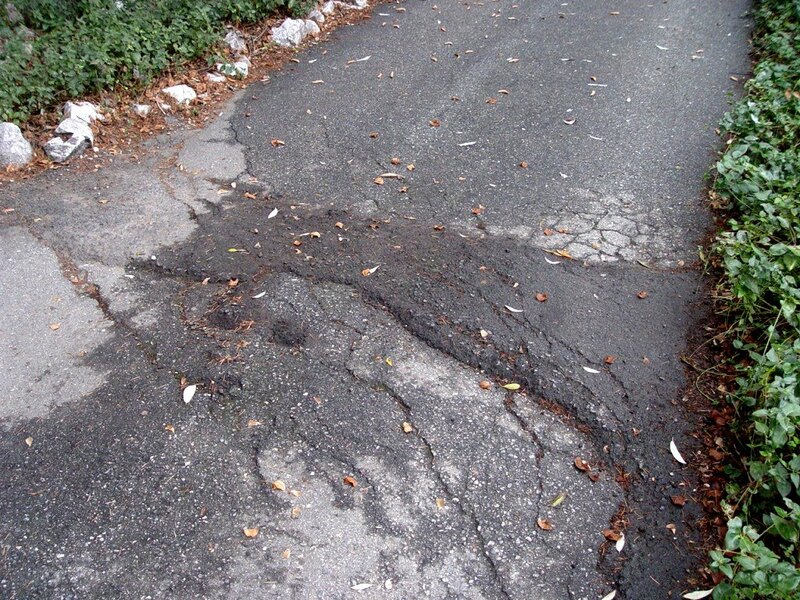 The Calaveras fault is part of the San Andreas system, and is closely related to the Hayward fault that tracks through the towns of the east shore of San Francisco Bay, including Oakland, Berkeley, and Hayward. Because the Calaveras fault in Hollister is creeping, it probably does not build up as much stress, and thus does not produce large earthquakes. Farther north, the fault is locked and building up considerable stress, and as such is capable of producing much more damaging earthquakes. A magnitude 7.0+ quake is not unlikely along this fault. 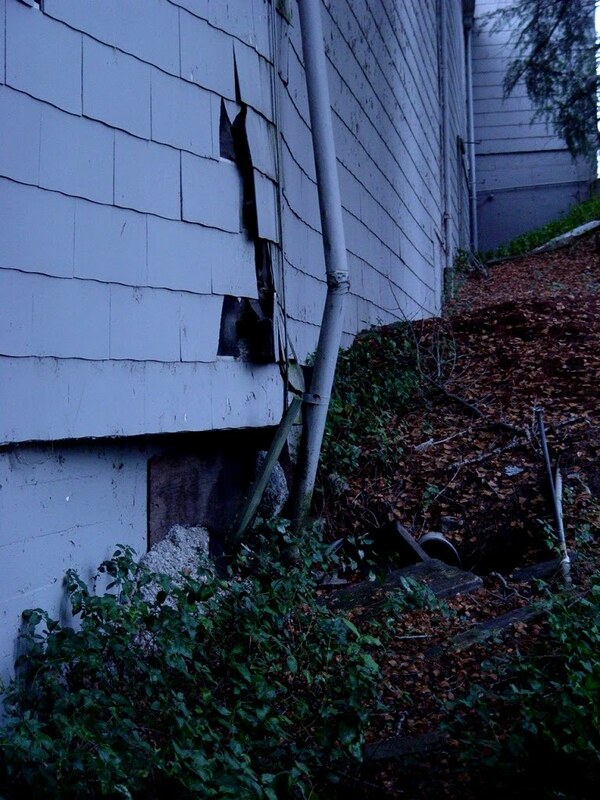 The retaining wall in the top photo has been used in many textbooks as an example of historical fault offset. 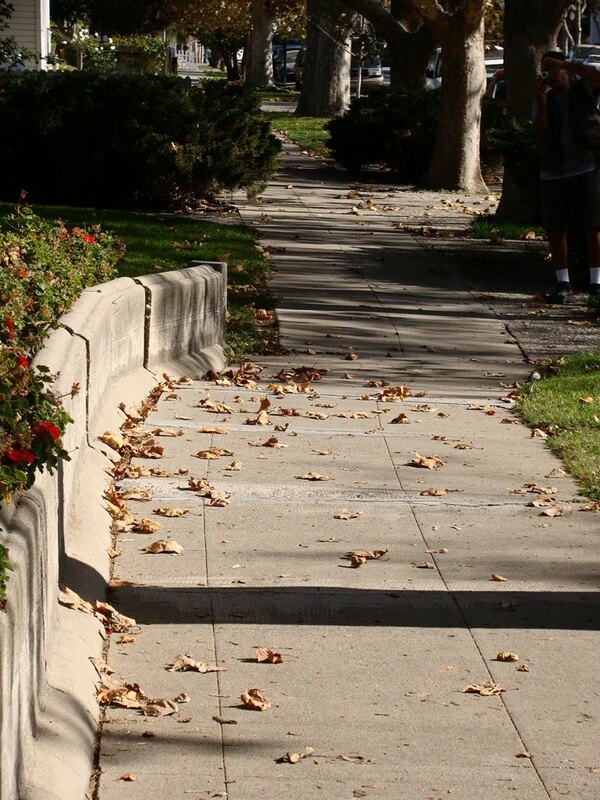 The sidewalk and walls are probably 50-60 years old, and have moved a couple of feet. The house nearby is built directly on the fault trace, and year after year is increasingly stressed, to the extent that the foundation must be replaced every so often (they raise the house off the foundation to do the work). Note that the far side of the fault has moved to the right from the photographer's perspective. This indicates that the Calaveras is a right lateral fault, just like the San Andreas. The street next to the retaining wall (second photo) was repaved within the last couple of years, but is already showing the effects of creep. The pavement is showing a series of diagonal cracks called riedel shears. Before long the surface will break into a single continuous crack. The adjacent new sidewalk has already split, and has been repaired (third photo). More information and details on the rate and pattern of fault offsets in the Hollister area can be found here and here. THE WORLD IS NOT GOING TO END ON DECEMBER 21, 2012! A movie is coming out, and the moviemakers benefit from lots of free publicity generated by everyone who is easily swayed by the newest and most bizarre conspiracy "theory". So it's going to be laid on really thick for the next two years, until the big day comes, and nothing happens. It may be useless to try and explain the faulty and ridiculous logic to the true believers, because in addition to their lack of critical thinking, they also see us scientists as part of the vast conspiracy. But that doesn't mean we shouldn't try. Who knows, when the world doesn't end, maybe they will remember that we tried to explain to them just why it wouldn't. Basically I'm speechless. The scenario certainly looks as if the commenter cribbed the movie "The Core" as their literary source. If only we could get some unobtainium in the next two years! Today's picture is a photo of a disaster we can and SHOULD be thinking about and preparing for: a major quake on the San Andreas fault in California. 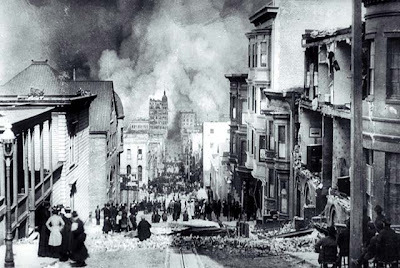 The 1906 event in San Franicisco killed around 3,000 people and enough stress is built up on several strands of the fault that another damaging quake will probably occur well within the lifetimes of most of my California readers. If you want to be paranoid, be worried about something that has a real likelihood of taking place. At the height of the ice ages in the high Sierra Nevada, an ice cap 2,000 feet deep covered the Tuolumne Meadows region. A massive 40-mile long glacier flowed down the Tuolumne River gorge, the largest in the Sierra, but tongues of ice crept over some drainage divides and flowed elsewhere. At Tenaya Creek, the glacier made a path into Yosemite Valley. 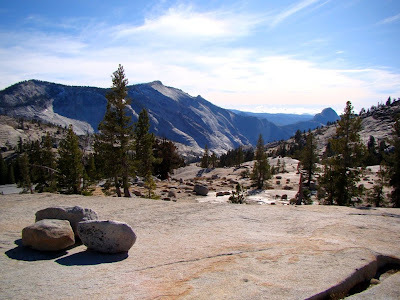 Along the way, the glacial scouring smoothed over domes, ripped up boulders, and tore rocks from the base of cliffs, steepening them, most spectacularly at Half Dome. One of Yosemite's finest vistas can be had from Olmsted Point, up the Tuolumne Road about eight miles southwest of Tuolumne Meadows. If Yosemite Valley lacks easily accessible features of glaciation, Olmsted Point has an embarrassment of riches. To the north (top photo), Tenaya Lake and Mt. Conness provide a nice example of a glacial tarn (lake) and a horn (a mountain peak "sharpened" by having rock plucked from the base of the cliffs below). The valley containing the lake has a broad U-shaped profile. To the south, Tenaya Creek plunges deep into the gorge below Clouds Rest and Half Dome. 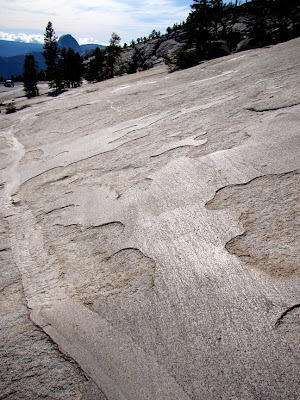 The vast granitic face of Clouds Rest (center of second photo) is scored by dozens of avalanche chutes where masses of snow constantly clear off the rock and prevent trees from gaining root. Farther downstream, Half Dome looms over Yosemite Valley. Glaciers never covered the dome. 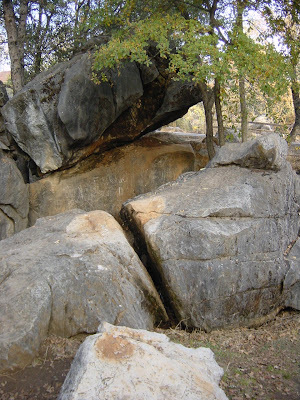 It took its shape instead from the expansion of the granitic rock as it was exposed by erosion. The expansion took the form of fractures that ran parallel to the surface of the rock (exfoliation), which tends to remove corners and edges. Massive vertical fractures called joints allowed the glaciers below the dome to quarry the rocks from below, forming the stunning vertical face of the dome. Up close, the evidence of the passage of glaciers is plentiful. Hundreds of large boulders, derived from somewhere upstream, litter the landscape (glacial erratics). The surface of the granitic rock has been scraped and scoured to produce glacial polish, striations, grooves and chatter marks (third photo). If you are more interested in the petrology, the glacial polish reveals incredible details in the granite: flow patterns, dikes, and pegmatite veins are visible everywhere, not to mention huge crystals of feldspar. Olmsted Point is all about spectacular scenery, but there is much in the way of geological learning opportunities as well. On a field trip, it is not to be missed! I headed up to Tuolumne Meadows this last weekend to have a last look at the Yosemite National Park high country before the roads are closed for the winter. The landscape certainly looked the part, the oaks and aspen were bright yellow, some early snowpatches covered the peaks, and there was a cold wind blowing; it was a delightful day! 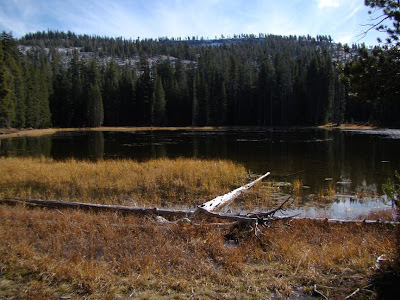 I made a short stop at one of my favorite teaching sites, Siesta Lake, a short distance from White Wolf Campground on the Tuolumne Meadows Road, about 10 miles up the hill from Crane Flat. Why is it special? Studying the effects and timing of glaciation in Yosemite National Park can be problematic, especially if you confine your studies to the floor of Yosemite Valley. The moraines are subtle, and some are missing because of postglacial erosion. The whole valley floor is covered by relatively thick forest, and ironically, it's hard to find many exposures of solid rock to observe glacial polish, striations and grooves (they are there, but you have to know where to look). The valley is not even the right "shape" (like a 'U') because a post-glacial lake filled the valley floor with sediment. Mass wasting has greatly modified the valley walls. A walk up the slopes behind the lake reveals barren granite, with polish, striations, chatter marks and other signs of glacial scraping. My students are usually able to figure out the general relationships and sketch them out on a simple geologic map. It's a great open-air classroom! The Airliner Chronicles: Why are these Volcanoes Here? 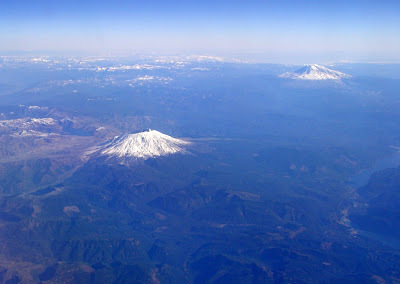 A photo from my flight to a GSA meeting in Seattle a few years ago recalls a question that had different answers, depending on when you asked the question, or more like, no answers if you go back far enough in time: Why are these volcanoes here? The subject popped up in my head as a result of the passing of one on of my professors this last month, Donald B. McIntyre. In reading some of the tributes to his life, I recalled that he had studied under Arthur Holmes, who was one of the pioneers in the acceptance of the hypothesis of Continental Drift, which was later refined into the theory of Plate Tectonics, an idea so radical that it pretty much rewrote an entire science (imagine if the chemists discovered an idea to replace atomic theory). Dr. McIntyre was actually involved in two revolutions of geology: he was also a historian who documented the life of James Hutton in several books. It just happened that I had picked up and started reading Plate Tectonics: An Insider's History of the Modern Theory of the Earth, edited by Naomi Oreskes. It is composed of 17 essays by the researchers who uncovered the evidence for plate tectonics in which they remember the events in their own lives that led to the new theory. It is fascinating to learn what was in their minds during the 1950's and 1960's as the realization slowly dawned that what they had always accepted about the structure and history of the earth was not necessarily true. What happens when a bunch of young professors and graduate students stumble onto something that was both unknown and unimagined? Reading these stories made me wonder about something else. What was it like to be a teacher or professor in the 1960's when the revolution of the science was at its height? I came on the scene a bit late to really know, taking my first class in geology in 1975, when plate tectonics was already becoming established in the classroom. If you were in the classroom in the 1960's, how much of the debate filtered into your curriculum? Was it a topic of discussion in classes, or was there even a realization that something big was going on in the science? I'm wondering what it was like for the people who weren't necessarily the pioneers at the forefront of radical research. Anyone want to contribute some thoughts and memories? The picture is of Mt. St. Helens and Mt. Adams of the Cascade Range. These volcanoes are now known to originate from melting of the crust that occurs as ocean crust (and water) are carried beneath the continent at subduction zones. It was once thought that the extra weight of sediments accumulating on the edge of the continents pushed downwards on the crust to where the heat of the planet melted the deepest rocks. What is the biggest geologic hazard facing the California? We have famously had disasters caused by earthquakes, floods, wildfires, and dam failures. But at least we don't have to worry about a Katrina-style disaster, of losing an entire city to floods brought on by levee failure during a major hurricane. Or do we? Welcome to the Sacramento Delta. The Sacramento and San Joaquin Rivers drain most of the Sierra Nevada and Central Valley, and represent 50% of the available water resources in the state. The Delta is practically unique in the world. Most deltas extend out to the sea, like the Nile or Mississippi, but the Sacramento is far inland. This is a consequence of sea level rise following the end of the last ice age, and the arrangement of structural blocks that compose the Coast Ranges, which forces the vast drainage through a single channel at the Carquinez Straits. The Sacramento and other rivers break up into a series of sloughs and channels that define around 60 "islands". These islands were once rather ephemeral, changing as a result of yearly floods and runoff events. When the agricultural potential of the islands was recognized in the 1800's, they were surrounded and outlined by a series of levees to stop the seasonal flooding. Ultimately an area of 1,150 square miles came under the plow. The law of unintended consequences was certainly in effect here. The peat-rich soils were originally anaerobic marshes, and buried carbon stayed buried. Once farming began, the groundwater was not constantly being recharged, the drier soils began to oxidize, and the land began to subside at a rate of an inch or two every year. Today the majority of the islands are below sea level, in many cases by as much as 10 to 25 feet. The levees prevent flooding by holding back the rivers and sloughs on a year-round basis. It is quite interesting to drive across the delta, and climb uphill in order to cross the rivers and channels! The construction of the levees had another effect that is essentially a positive, but is also a problem. The delta is subject to tidal changes, and saltwater intrudes into the delta during high tides and droughts. Prior to levee construction, the saltwater intruded many miles further into the delta, but in recent decades the intrusion has been far less (this is also an effect of water releases from dams far upstream). 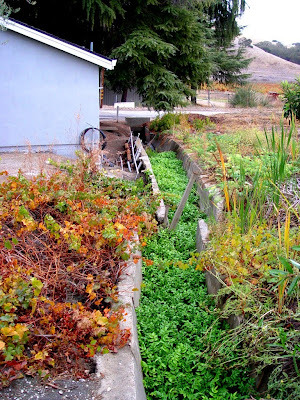 Which leads us to California's huge vulnerability: what happens if the 1800's-vintage levees fail? We have a pretty good idea because it happens on a much too regular basis, more than 100 times since 1890. Major flood events like the 1997 disaster caused levee failures in several places. Some failures have been caused by trivial things like muskrat burrowings. Singular events such as these have flooded thousands of acres. But what would happen if dozens of the islands were flooded all at once? Unthinkable? Unfortunately a very real possibility. It's all about earthquakes. The saturated earthen levees are subject to liquefaction, where a loss of cohesion of the soil results from the breakdown of the surface tension of the water that was holding the grains together. Think of it this way. A sand castle holds its shape in damp sand, but loses it if too much water is added. If you stomp on wet sand at the beach, it will liquefy, and you will sink a few inches. The same thing can happen on a large scale with a levee, and thus earthquakes stand as one of the most greatest threats to the integrity of the levee system. And the system has not been truly tested: many of the levees hadn't yet been finished in 1906, and the 1989 Loma Prieta quake (magnitude 6.9) was too distant from the delta to have much of an effect. But a number of active faults pass through or near to the delta, and it won't require a "BIG ONE" to do the damage. A 6.0-6.5 near by on one of these faults will be more than enough. If widespread levee failure takes place, dozens of islands will be flooded with saltwater, and the thousands of acres of prime agricultural lands will be lost. To be sure, thousands of people live on these tracts, and they will be homeless, perhaps permanently (is it really worth it to reclaim an island that is 25 feet deep in salt water?). But this isn't the biggest problem. It's that fact that 23 million people, most of the population of the state, are depending on delta water for their domestic and agricultural use. The California Water Project and other systems pump water out of the delta for use by cities and farms off to the south. In the event of a worst-case scenario earthquake, the pumps will be fouled by salt water for months or even years. The state's single largest source of fresh water will be gone. It's a huge problem that until recently was not receiving attention, but apparently that has changed, and the legislature and governor are catching up to the pleas of the water managers about the huge vulnerability of our water systems. 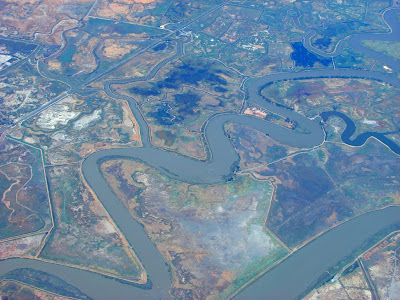 I snapped today's picture if the Sacramento Delta on a flight out of San Francisco in 2006. Mother Nature cries, and by the way, AFRICA IS GOING TO SPLIT IN TWO!!! This is how one would imagine mother nature would express her sentiments about our inability to reduce global warming. 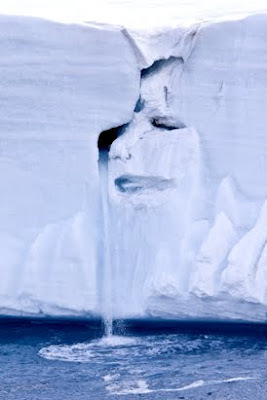 It seemed an obvious place for her to appear, on the front of a retreating ice shelf, crying. Meanwhile in other news of the day, AFRICA IS GOING TO SPLIT IN TWO! Volcanic activity may split the African continent in two due to a recent geological crack in northeastern Ethiopia, researchers said on Tuesday. If you are expecting a story of massive disruptions of the crust, giant tsunamis, magnitude 12 earthquakes, and millions of people dead, well, no the article doesn't do that. It is a half-decent attempt (and I mean "half") by a non-science journalist (or so I assume) to describe research going on in the Afar Rift, a region where the crust is splitting and moving slowly apart. I'm a little disappointed that the editors let such a headline go by (I wonder HOW such a thing could happen? ), and even more disappointed that it took until the last paragraph of the article to point out that the process they are describing would unfold over millions of years. I've often imagined that the whole misconception that California would fall into the Pacific during the "BIG ONE" started this way. Someone read a report describing how strike-slip motion on the San Andreas Fault would eventually move part of California into the Pacific forming an island, and somehow revved up the timetable from millions of years to a single earthquake. 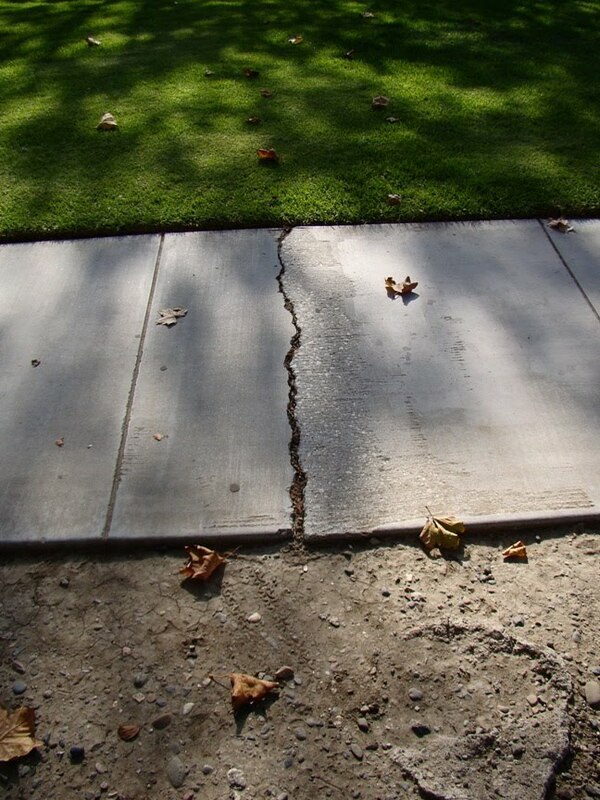 It has unfortunately become the one thing that everyone seems to know about the San Andreas fault. No links were provided in the article, and it didn't help that the article misspelled the researcher's name (somehow 'Ayele' became 'Arefe'). I think the article also mistook 'magnetic' for 'magmatic' (my students do that sometimes). I finally tracked down the article, the citation is below, and the abstract can be found here. Ayele, A., D. Keir, C. Ebinger, T. J. Wright, G. W. Stuart, W. R. Buck, E. Jacques, G. Ogubazghi, and J. Sholan (2009), September 2005 mega-dike emplacement in the Manda-Harraro nascent oceanic rift (Afar depression), Geophys. Res. Lett., 36, L20306, doi:10.1029/2009GL039605. A recent post included a description of the hydraulic mining that took place in the Sierra Nevada Mother Lode here in California. We visited some of these sites on our recent field studies exploration of the gold mining region. The last stop of the day was at Columbia Historical State Park, where in the last rays of the setting sun we took in one of the more unusual "ghost" towns of the Mother Lode. First off, it is not really a ghost town, as several thousand people live in the area, and the region supports a community college that is part of our district. It is, on the other hand, one of the best preserved towns of the Gold Rush era. After it burned down a few times early on, the inhabitants caught on that brick might be a better construction material than wood, and so a rather large selection of 1800's vintage buildings survive. Museums, stores, and restaurants, even an old-time theatre are available for tourists. For we geologists, and for children (is there a difference? 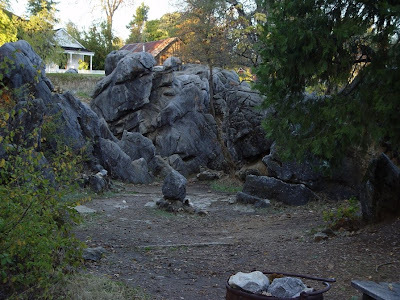 ), the town has a special treat: big rocks! What's the story here? In Paleogene time (I still like saying "Tertiary time"), the Sierra Nevada was a vastly different place. The mountains were lower, and large rivers traversed the landscape in shallow valleys. 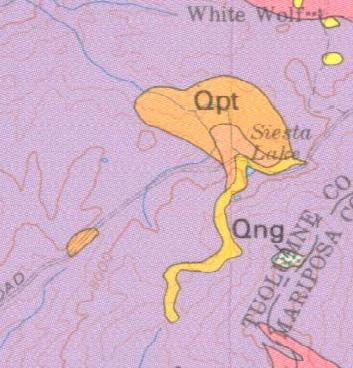 Flowing across the Mother Lode quartz veins, the rivers picked large amounts of gold, and carried it downstream. A particular channel, the Tertiary Calaveras River, flowed across an exposure of marble, part of a metamorphic exotic terrane called the Calaveras Complex. Marble, like limestone, is composed of calcium carbonate and is easily dissolved by slightly acidic water. Over the millennia, caves developed underground, and the surface was punctuated by sinkholes and blind valleys, features typical of karst topography. The surface rocks were extremely uneven with deep crevasses and cracks. The rough surfaces acted like riffles where the river passed over, trapping vast amounts of placer gold. 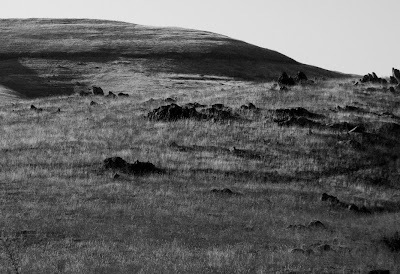 Much of the surface around Columbia and nearby Rawhide Flat is composed of these unusual looking rocks, pictured above. But Columbia itself sits atop a flat shelf around 15 to 20 feet higher than the bouldery surface. Why? It turns out that the town sits on a section of the original soil surface that existed before the hydraulic miners attacked the rocks in the area. Before the miners arrived, the boulder outcrops were not visible, as they were buried in clays, soil and river deposits. Once the miners figured out that huge amounts of placer gold occupied the cracks and fissures, they pursued the riches with wild abandon, spraying away the soil and sediment, ultimately recovering between 3 and 4 million ounces of gold (think $3 to $4 billion at today's gold prices!). 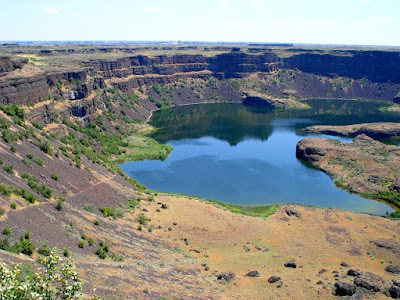 It has been called one of the richest single placer deposits in the entire world. The miners worked their way right up to the very edge of town, and I have heard that occasionally buildings would burn down under suspicious circumstances. Instead of rebuilding, the site was mined instead. The town is a pleasant place to visit, and the Candy Shop comes highly recommended. Be aware that because of the California state budget mess, parts of the park are shut down to save some piddling amount of money for the state. For instance, a number of the park bathrooms are locked up. I don't know the present status of the museum.